A fifth of people in hospital in England are not always treated with respect and dignity, according to a wide-ranging survey of NHS patients. Analysis of the 2012 poll has found that poor care was more likely to be experienced by those aged over 80. It also found that more than a third of patients who need help at mealtimes did not receive enough assistance. NHS England said looking after older patients well was a critical test of a modern health service. It also said that rises in the number of nurses on wards since the data was collected should result in widespread improvement. Age UK, which helped to advise the researchers, said there had been "remarkably little change" over time in the care experienced by older patients. Thousands of hospital patients took part in the survey. The report, carried out by the Centre for Analysis of Social Exclusion at the LSE, found that poor or inconsistent care was more likely to be experienced by women as well as the over-80s. The risks were also higher for those with a long-standing illness or disability like deafness or blindness, with those in hospital for a long period, or who stayed in three or more wards, at an even greater risk. The report was compiled using evidence from the Adult Inpatient Survey 2012, which covers people aged 16 or above who stayed in hospital for at least one night. According to the report: "There was a widespread and systematic pattern of inconsistent or poor standards of care during hospital stays in England in 2012. "Patient experiences of inconsistent or poor standards of dignity and help with eating do not appear to be limited to isolated 'outlier' providers. Rather, this appears to be a significant general problem affecting the vast majority of NHS acute hospital trusts." The researchers found 23% of patients reported experiencing poor or inconsistent standards of dignity and respect, the equivalent to 2.8 million people a year, of whom a million would be aged 65 and over. 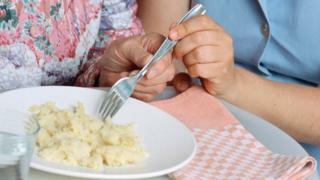 They also found that a quarter of all respondents said they needed help with eating during their hospital stay, amounting to just under 3.5 million patients a year. Of those who needed help with eating, 38% said they only sometimes, or never, received enough help from staff - equivalent to 1.3 million people a year, and 640,000 aged 65 and over. Age UK charity director Caroline Abrahams said: "It must be recognised that the data this research is based on is two years old now and that the newest figures suggest some welcome improvement, especially as regards older people's experiences of dignity, but this sobering report certainly shows that hospitals need to redouble their efforts. "Above all it is really worrying, if perhaps not altogether surprising, that the more vulnerable an older person is, the greater their risk of not being treated as we would all wish for ourselves or our loved ones. "Turning this situation around ought to be a top priority and no hospital can afford to be complacent."